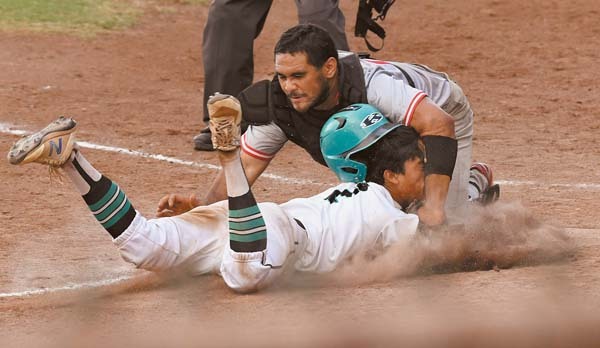 WAILUKU — Things never seem to be easy in the Maui Interscholastic League Division I baseball race. Maui High School lived that credo Saturday on a damp night at Maehara Stadium. Freshman Zachary Dando delivered the go-ahead run with a double in the bottom of the sixth inning of the Sabers’ crucial 7-5 win over Kamehameha Maui. Maui High’s Keelan Yagi, the starting catcher, came on to pitch with the Warriors threatening, getting the final two outs of the game via strikeouts. Dando’s double was just the second hit for Maui High on a night that the Warriors had seven hits and left the bases loaded in the seventh inning. 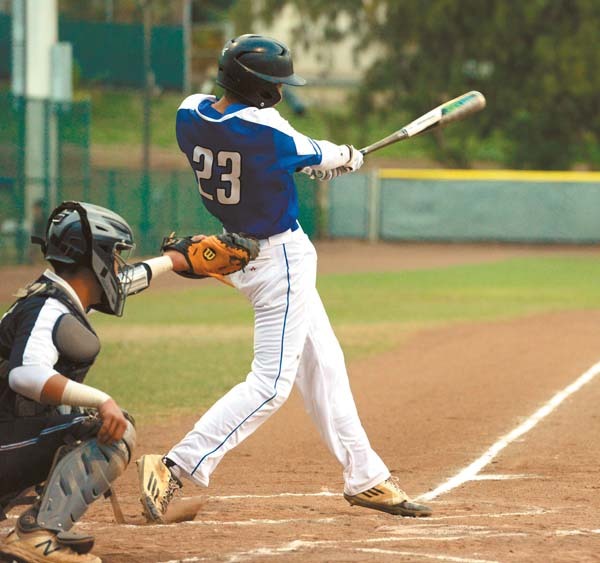 Dando’s double gave the Sabers a 5-4 lead and they scored twice more in the bottom of the sixth before the Warriors got a run back in the top of the seventh on a bases-loaded walk before Yagi’s back-to-back strikeouts set off a celebration by Maui High. The result left the Sabers 2-1 in MIL play, while the Warriors fell to 4-2. 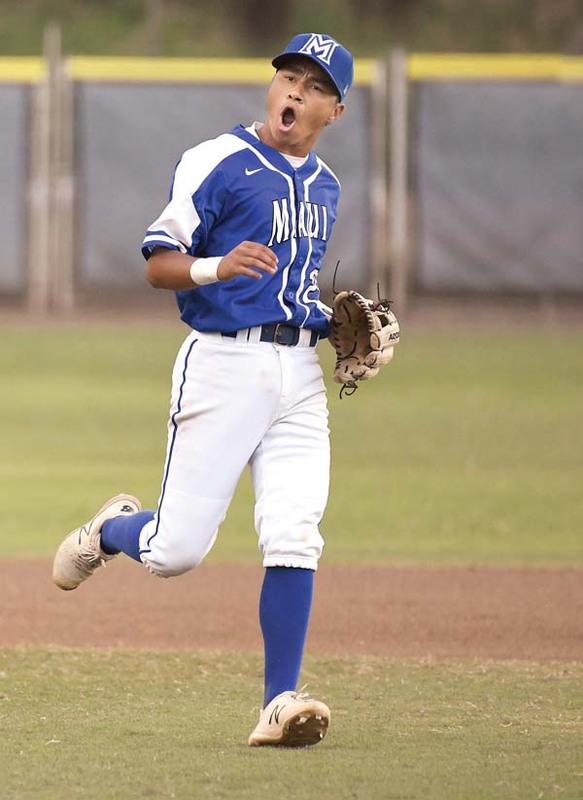 Maui High won Friday’s game 7-6 in 8 innings after the losing the series opener 2-0. The Sabers took a 1-0 lead in the bottom of the first inning when Taelen Bates walked with the bases loaded, but pitcher Cyrus Robson got out of further trouble with a strikeout of Aizeah Lakalaka. Robson was lifted after one inning in which he walked three. The Sabers pushed the lead to 2-0 in the second when Kory Shirota scored on a wild pitch. Shirota reached on a fielder’s choice after Aidan Vigneux led off the inning by reaching on a two-base error. Meanwhile, 5-foot-3 Maui High sophomore Dylan Kokubun sat down the first seven batters he faced before the Warriors found some offense. Keoni Painter walked with one out in the third inning and took third on a single to right field by William Thompson. Thompson was thrown out at second base for the second out while trying to stretch his hit. Painter scored after a throwing error on a grounder by Konnor Palmeira before Tiger Caulford and Tristan Catan walked to load the bases. Kokubun got out of the inning still ahead 2-1 by inducing a long fly ball by Rio Moleta. The Sabers loaded the bases with one out on two walks and a hit batsman in the bottom of the third inning. A wild pitch scored Kymani Corpuz to make it 3-1 and move runners to second and third bases. Another walk loaded the bases again and brought in Catan to pitch. Shirota delivered a sacrifice fly to right field to make it 4-1. Catan got out of the jam when first baseman Moleta dove to snag a hot grounder by Tyrell Ruiz and Catan just beat the speedy Ruiz to the bag. The Warriors loaded the bases in the fifth inning on a base hit by Thompson and a walk before Caulford laid down a bunt that went for a base hit. A wild pitch scored Kamehameha Maui’s second run before Catan grounded out and Moleta lined out to end the inning. Kamehameha Maui loaded the bases with one out in the top of the sixth when Dana Bui beat out a bunt for a hit, Kelton Tom delivered a solid single to left field, and Painter reached on what appeared to be a sacrifice bunt attempt to third base when the Sabers left first base uncovered. Thompson then sent a slow roller to third base and Corpuz fired home to force out Bui at the plate for the second out. Palmeira then delivered a two-run single to tie the score at 4-4. Thompson was then thrown out in a rundown between third base and home after Caulford bunted to third base. In the bottom of the sixth, Ruiz reached first base with one out when he struck out on a wild pitch and took second on another wild pitch. Kokubun was hit by a pitch and Dando then delivered his RBI double that scored Ruiz — it was just the Sabers’ first hit since the first inning. 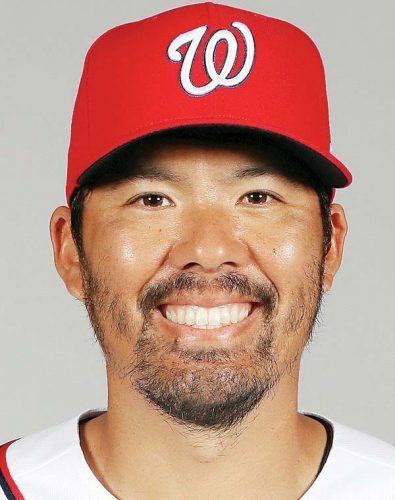 After Dando’s hit made it 5-4, Yagi delivered a sacrifice fly to foul territory in right field to score Kokubun before Dando scampered in to score when the throw home got away. After four walks and one groundout to start the seventh, Yagi came in to pitch with the bases loaded and a run in. He struck out Painter swinging and Thompson looking. Cyrus Robson, Taylor Arashiro-Mamuad (2), Tristan Catan (3) and Kelton Tom; Dylan Kokubun, Nainoa Garso (4), Zack Chmeleck (6), Kobe Galinato (7), Keelan Yagi (7) and Yagi, Micah Jae Balmores (7). W–Chmeleck. L–Catan. Sv–Yagi. 2B–Maui High: Zachary Dando. 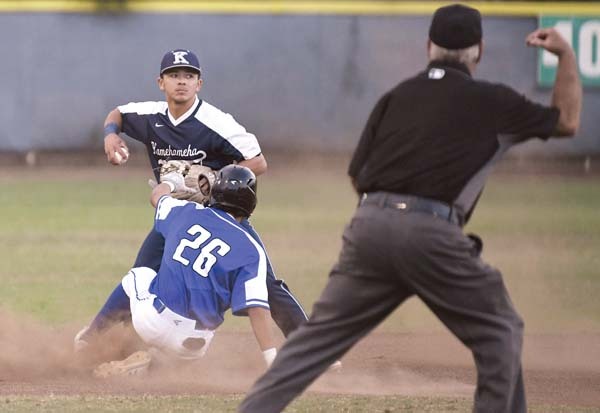 Leading hitters–Kamehameha Maui: William Thompson 2-4, run. Kealaula Medeiros, Vincent Iwamura (6), Kamahao Acpal (7) and Koapaka Purdy; Kai Gumtang, Mike Beesing (4) and Beesing, Ayvin Ixcotoyac (4). W–Medeiros. L–Gumtang. 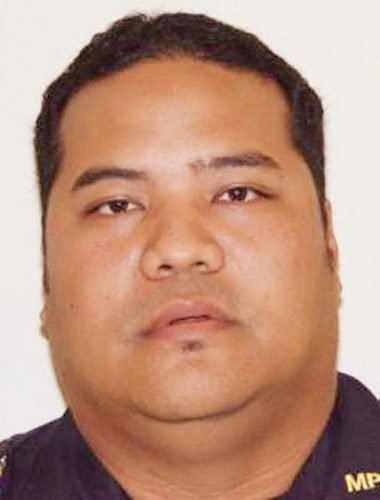 2B–Lahainaluna: Vincent Iwamura. 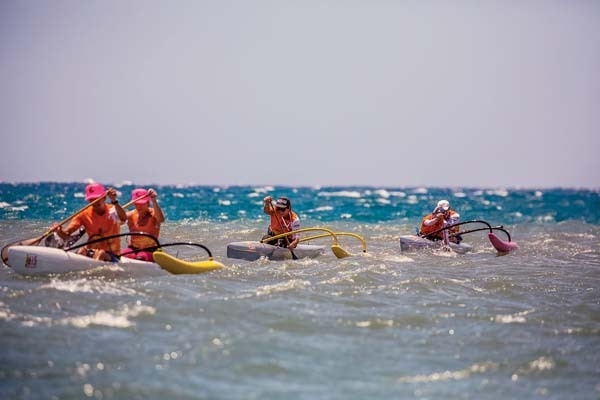 3B–King Kekaulike: Beesing. Leading hitters–Lahainaluna: Ekolu Mathias 2-4, run; Iwamura 2-3. Robert Gebkin, Matt Sylva (6) and Hunter Otani. Loea Helekahi-Matsuda, Kolomona Kaupe (6), Irie Pu-Akima (6) and Pu-Akima, Blade Hoopai (6). W–Sylva. L–Helekahi-Matsuda. Leading hitters–St. Anthony: Gebkin 2-5, 2 runs; Michael Vergel de Dios 2-2, 2 runs. W–Kaimana Nakayama. L–Devrene Kahananui-Alejado. 2B–Lanai: Naighel Calderron. 3B–Lanai: Calderon. Leading hitters–Lanai: Calderon 2-3, run; Ardell Mueller 2-3, 2 RBIs, run. 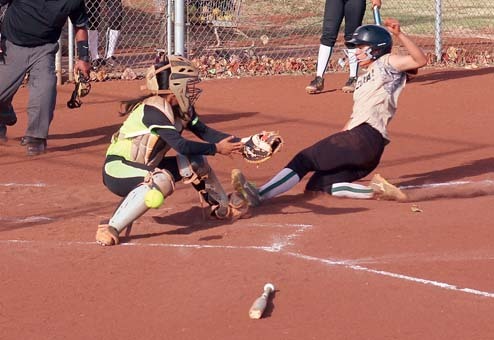 Molokai: Saven Kaahanui 1-4, 2 runs; Laysen Bush 2 runs; Lassen Bush 2-4, run, RBI. Baldwin vs. King Kekaulike at Maehara Stadium, 3:30 p.m.